Power and charge your Garmin sat nav, Garmin handheld, cycling or other device at home or away with this genuine Garmin AC adapter cable with two USB cables including 1x micro USB and 1x mini USB. To use simply plug the adaptor into the mains and connect to your Garmin model via either its micro or mini USB port. When connected the AC adapter cable power (if applicable) will also charge your Garmin's internal lithium-ion battery, enabling you to use your sat nav wirelessly in your vehicle. Compatibility: Compatible with the majority of Garmin units, before buying please check that your specific model is listed. 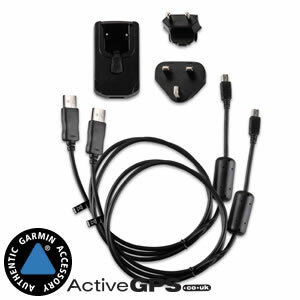 Power, charge and plan your routes on your Garmin sat nav and other lithium-ion battery based Garmin product in the comfort of your home, hotel or place of work with this genuine Garmin AC mains adaptor with both mini and micro USB cables. The mains charger supports 100volt to 240volt and includes a continental adapter. So if you happen to be abroad in mainland Europe you can still power your Garmin sat nav or GPS device from your hotel or other accommodation. Two adapters are included these are: UK and European. Please note that an adapter for North America is NOT included. What's more the mini or micro USB cable detaches from the mains AC adaptor, enabling you to use the USB cable to update and transfer data to/from your Garmin system and your PC. When connected to any Garmin sat nav, the AC adapter cable will charge your units internal battery, enabling you to use your sat nav wirelessly in your vehicle. Your Garmin's screen also indicates how much charge the internal battery has left. To increase the accuracy of this indicator, Garmin recommend that you fully discharge the battery and then fully charge it. They also suggest not unplugging your nuvi model until it is fully charged. Depending upon model the AC power cable may not charge your Garmin handheld or cycling GPS's internal battery. This is down to the batteries the unit uses. For example the AC adapter will not charge normal non rechargeable AA or AAA alkaline batteries. Instead you can use it to power your unit to plan routes, view tracked logs, etc and all without draining the battery. Models such as the Garmin Montana 600 series and Edge 800 series which both use a lithium-ion battery can be charged using the AC adaptor cable. Most Garmin devices require the mini USB cable connector, as pictured on the right in the photo. 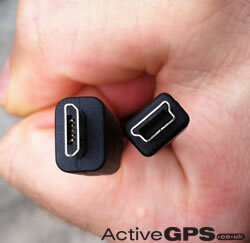 However a handful of Garmin systems require the micro USB connector pictured on the left in the photo. 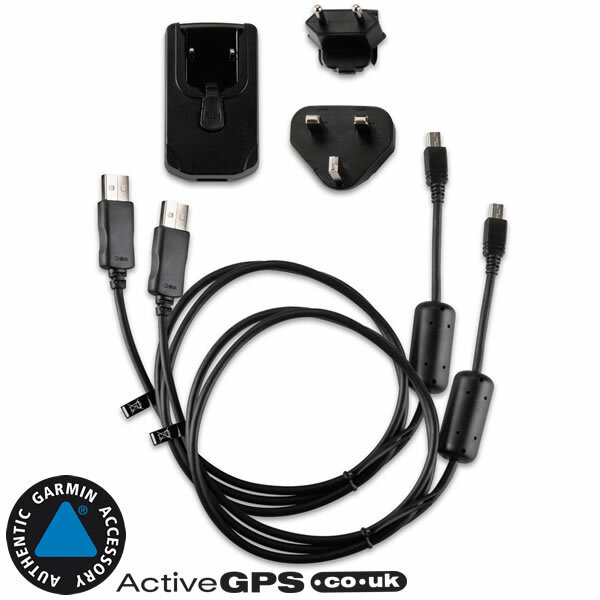 The Garmin AC adapter and USB cable kit available to buy on this webpage includes both mini and micro USB cables, and is therefore compatable with most Garmin devices. However, before buying please check that your specific Garmin model is listed below in the "What is the AC adapter and USB cable kit compatible with?" section. ‣1x mini USB cable and 1x micro USB cable. What is the AC adapter and USB cable kit compatible with? 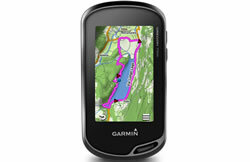 Garmin aera 500, 550, 560, 795, 796, Garmin fenix 2, Approach G3, G5, G6, G7, G8, S1, S2, S3, S4, S5, S6, S20, Atemos 100/K 5 System, 50 and K 5, Camper 660, 770, 780, Colorado 300, D2, Dakota 10, 20, Dash Cam 10, 20, 30, 35, dezl 560, 570, 580, 760, 770, 780, dezlCam, dezlCam 785, Edge 20, 25, 130, 200, 205, 305, 500, 510, 520, 520 Plus, 605, 705, 800, 810, 820, 1000, 1030, Explore, Explore 820, Explore 1000, Touring, Touring Plus, eTrex 10, 20, 20x, 30, 30x, Touch 25, Touch 35, Legend, Summit, Venture, Vista (all models), fenix, fenix 2, Forerunner 10, 15, 25, 30, 205, 220, 225, 25, 30, 305, 310XT, 610, 620, 910XT, 920XT, Foretrex 301, 401, Drive 40, 50, 60, 61, 62, DriveAssist 50, 51, DriveLuxe 50, DriveSmart 50, 51, 55, 60, 61, 65, 70, DriveTrack 70, 71, fleet 590, 660, 670, 770, 780, 790, Swim, GPS 60, 72H, 73, 76, GPSMAP 60, 62, 64, 64, 66, 76, 78, 96, 175, 276C, 276Cx, iQue 3000, inReach Explorer+, SE+, Montana 600, 600t, 610, 610t, 650, 650t, 680, 680t, Monterra, nuLink 1690, 1695, 2340, 2390, nuvi 30, 40, 50, 65, 200, 300, 400, 500, 600, 700, 800, 1200, 1300, 1400, 1600, 2200, 2400, 2500, 2600, 2700, 3500 series, nuviCam, Oregon 200, 300, 400t, 450, 550, 600, 650, 700, 750, StreetPilot 2610, 2620, 2650, 2660, 2730, 2820, 7200, c300 series, c500 series, i3, tactix, VIRB, Elite, X, XE, zumo 220, 340, 345, 346, 350, 390, 395, 396, 590, 595, 660. Question: Please advise if this kit would allow me to use the USB to USB Mini cable from a 12V/USB connector which plugs in to the cigarette lighter socket in my car, to charge my device. 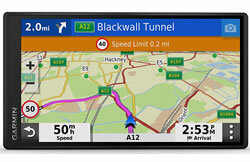 I have tried a standard USB to USB Mini cable and my Sat Nav thinks it is connected to a computer. Answer: The Garmin mini USB cable is for this AC adaptor and can also be used for PC use. Your Garmin device should be charged using the correct Garmin vehicle power cable. We cannot recommend using the mini USB cable with a third party adaptor in your car. One factor to consider is that your Garmin will most likely require a 5 volt input at a certain current - which the correct Garmin charger will provide. Your car adaptor will output 12 volt which, via a third party adaptor, could damage your Garmin. A USB outlet in your car may provide insufficient power for your Garmin, hence the unit 'thinks' it is only connected to a PC. Do you have a question about the Garmin USB AC charger? Submit your question via our contact page.